For as long as the T8 lamp has been the standard for industrial fluorescent lighting, MEBULBS™ has been at the forefront of efficient design and high-quality light. Our instant-start T8 single-pin Premira® lamps burn brighter than any linear fluorescent tubes on the market while using less energy and natural resources. These F96T8 lamps are made for use with instant start electronic ballasts, which work by shooting high voltage amounts through the lamp and fixture when you flick the switch. This starting method uses up two fewer watts per lamp than rapid start lamps, while starting better at lower temperatures. They are particularly ideal for buildings where you are leaving the lights on for long periods. We have industrial quality down to residential quality T8 single-pin fluorescent lamps to meet your quality demands and budget. 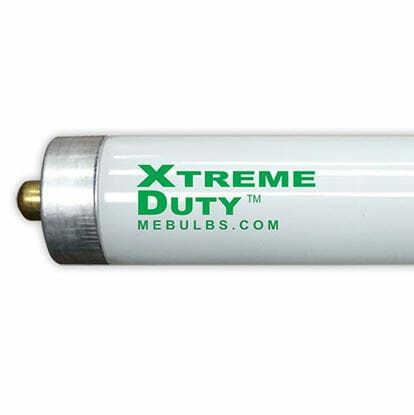 Xtreme Duty™ F96T8 tubes have a premium design and construction for use in factories, manufacturing facilities, airport hangers and other large high-ceiling areas. The phosphors we use produce light that’s up to 40 percent brighter than regular fluorescents, while a cathode shield prevents end blackening to reduce lumen loss over time. Your building will look better than ever under light that reflects more accurate colors and doesn’t strain the eyes. Our industrial T8 single-pin lamps come with a six-year warranty, meaning nine fewer bulb changes in this time. 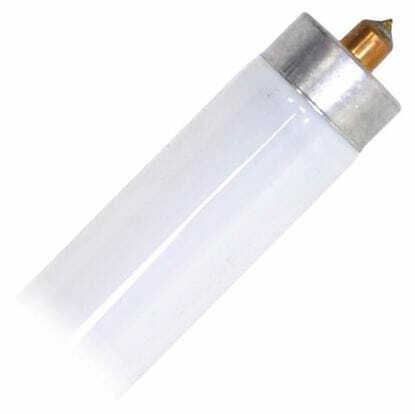 If you don’t use your linear fluorescents as often, we have light commercial and residential fluorescent tubes as well that are better than what is offered in big box stores. Each one is manufactured to our exact specifications by leading facilities to produce light up to 80 percent more efficient than halogens, metal halides and other common light sources. MEBULBS has been devoted to cutting edge lighting technology and premier customer service since 1974 and looks forward to helping solve your lighting problems. 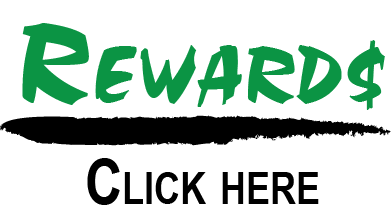 Contact us to learn more about bulk ordering and other ways to save even more!